Town officials plan this month to realign a traffic island in Mead Park so that motorists don’t cut the wrong way past it, and also to re-stripe the parking for areas that are expected to see heavier use with the newly turfed little league baseball infields. 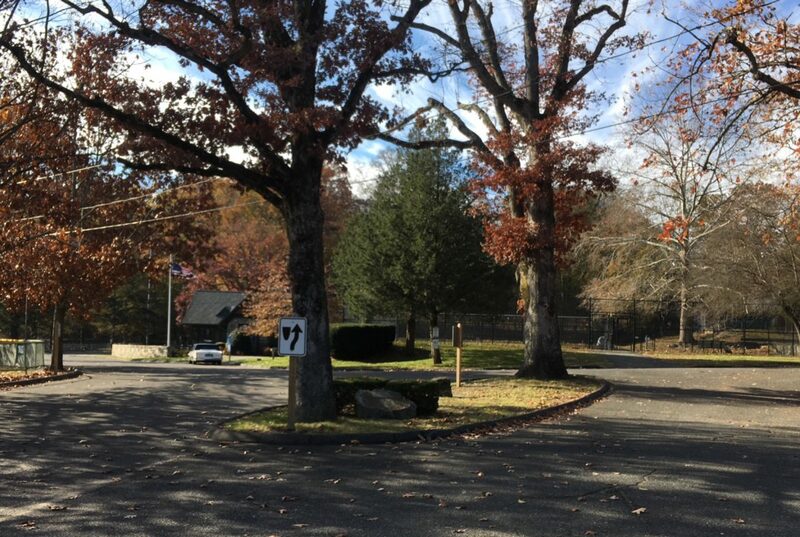 Public Work Director Tiger Mann told members of the Parks & Recreation Commission at their most recent meeting that the town wants to “try and manage the parking in and around the [Mead Park] Lodge” as well as the traffic that flows toward that area from the main entrance on Park Street. Specifically, the traffic island at the “T”—where the main parking lot approaches the tennis courts—will be reconfigured, with new hash marks to go down, to prevent drivers from zipping past it on the left. “Right now we have got a lot of people cutting to left of the island, even though we have signage that says ‘keep right,’ they are cutting to the left because it is a little bit wider in that area,” Mann told the Commission at its March 13 meeting, held in Town Hall. “If we if we reorient island—the tree to the western side of the island is in decline, so we are looking to take that out—realign the curb itself, making it straighter so that it will actually narrow down that left-hand lane, so people will be forced to go to the right and around the T,” he said. The town also will either curb or stripe an area below the traffic island to make it narrower and indicate to motorists that they should keep right as instructed, he said. Public works is “looking at striping originally to see how it goes, and then I can hard-pan it later, meaning I can put some curbing in and then some landscaping behind it, just to let everybody know exactly how the flow is supposed to work,” he said. During one visit to Mead Park with Parks & Rec Commissioners Laura Costigan and Francesca Segalas, Mann said he saw four cars zip past to the left of the island in the space of 10 minutes. His comments came during an update for the Commission on the status of several projects in town, including at Waveny Pond and with respect to a proposed new access road and expanded parking area near the water towers at Waveny. Additionally, a second traffic island deeper into the park, where some motorists have tended to park when the lots there are full, will see an extended curb and protective guide rail around it, under the plan. The plan also shows 23 parking spaces plus one disabled space facing Mellick Field, 10 spaces facing the Mead Park Lodge, as well as one parallel parking space on the approach to the Lodge parking and one disabled space there. The new parking plan for Mead, drawn up by Keith Simpson Associates of New Canaan, originally had been approved by the Commission in late 2017.